It wasn’t long ago when interacting with government could be a frustrating and disjointed experience characterized by long lines, interminable wait times on the phone or a fruitless search for information. Seeking answers or finding needed services was a time-consuming, tedious and sometimes inaccessible journey for many citizens. Today, many agencies have embraced a new model that expands the notion of government beyond the confines of an office building. Now, the pervasive digital culture that defines society – at work and at home — is steadily becoming the norm in government. Almost everyone expects 24/7 availability, cross-platform integration, multiple communication channels and an immediate response. Government leaders know they can no longer rely on traditional methods of conducting business. Monolithic technology investments from just a few years ago are complicated, expensive to maintain and don’t allow employees time to focus on higher-priority services. Many agencies are eager to adopt modern processes that enable them to deliver the digital services citizens demand. Government agencies that rely on outdated technologies and processes also may find it difficult to attract and retain talented employees; and business owners may be reluctant to set up shop in these jurisdictions. Advances in technology have unlocked the doors to city hall in a way that was unimaginable 10 years ago. Agencies are increasingly digital and interconnected; constituents instantly interact with city and state employees, and devices — sensors, smart phones, wearable technology and cameras — provide a constant stream of digital data to help agencies think proactively about citizen needs. Forward-thinking agency leaders recognize that serving both constituents and employees requires IT systems and solutions that are responsive instead of reactive, and positioned to turn on a dime to meet the needs of a modern workforce. These leaders know they must address the needs of a citizenry possessing different levels of digital access, from the constantly connected consumer to the digitally disenfranchised. 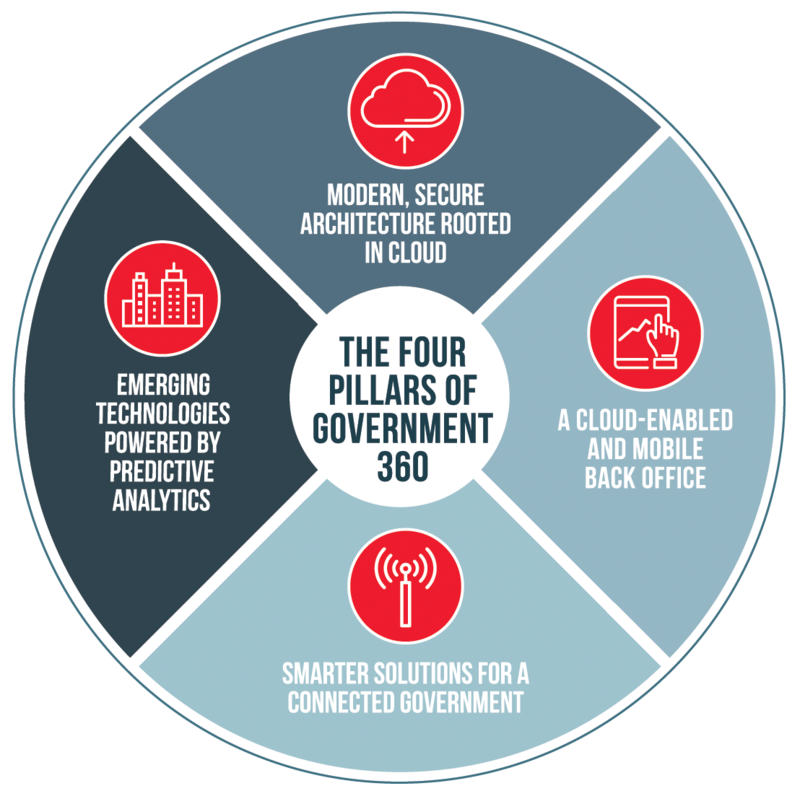 This is the vision behind Government 360, a strategy for ongoing government modernization. As an approach, it encompasses a modern, flexible infrastructure and widespread automation and mobility. It means always-on availability through multiple channels and data-driven insights gathered via machine learning and predictive analytics. These digital touchpoints can create a circle of citizen engagement, constituent service, private business productivity and civic mission. Over the coming months, you can follow the progress of this new way of perceiving government through the eyes of state and local IT leaders just like yourself. Each of these pillars will be accompanied by a story from one of your peers, and a live webcast where you’ll have a chance to ask questions about their success stories. Meet us where we are online here at e.Republic and on social media: #OracleGov360. As agencies move toward the cloud, they can work in smaller, more modular IT components, allowing them to be more agile and providing better visibility into — and control over — their operations. Cloud also enables government agencies to become more efficient, freeing up resources to do more value-added tasks. Ultimately, agencies eliminate costs out of their infrastructure and dedicate more capital to innovation. Government employees do their work in and around the community. Through the seamless connection of mobile devices and applications, they can make instant assessments and impact decisions. The back office is a springboard for enhanced connectivity, business automation and ensuring government employees have the right tools to do their jobs. This requires back-office services to become both mobile and enhanced with automation through artificial intelligence (AI). By integrating evolving technologies like the Internet of Things and AI, government can become increasingly smarter and citizen-centric, fostering a vibrant and streamlined business climate. Agencies can reduce repetitive and menial tasks, while helping boost economic development through an always-open digital front door to city hall. Government 360 is not just about being smart today; it’s also about being predictive for tomorrow. The more digital data an agency produces, the more business intelligence it can gather, and the more predictive analytics can inform and improve government services. A growing and diverse student population, along with disruptions brought about by evolving technologies, are creating an opportunity for college leaders to create tomorrow’s campus, today.